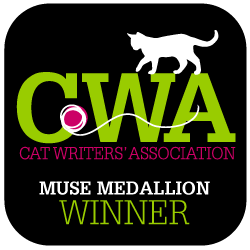 You are here: Home / Cats and People / How Do I Trim My Cat’s Claws? 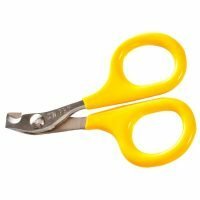 How Do I Trim My Cat’s Claws? We recently moved from a house with a large yard full of trees to a third-floor apartment. I was very worried about my cat, Rosie, as she had always been an indoor/outdoor cat who had lots of trees to scratch on. We got her a litter box and two scratching posts as well as a cat tree and she’s made a pretty good transition over the last two months. But her claws are really long, to the point of getting stuck on rugs and scratching me when she’s just sitting in my lap. I am terrified of clipping her claws. I’m wondering if there is a tree-like cat scratching post or emory board for cats that works. If not, can you recommend an easy nail clipper for a scared novice like me? Thomas: Kris, it sounds like you’ve got a two-part question here. 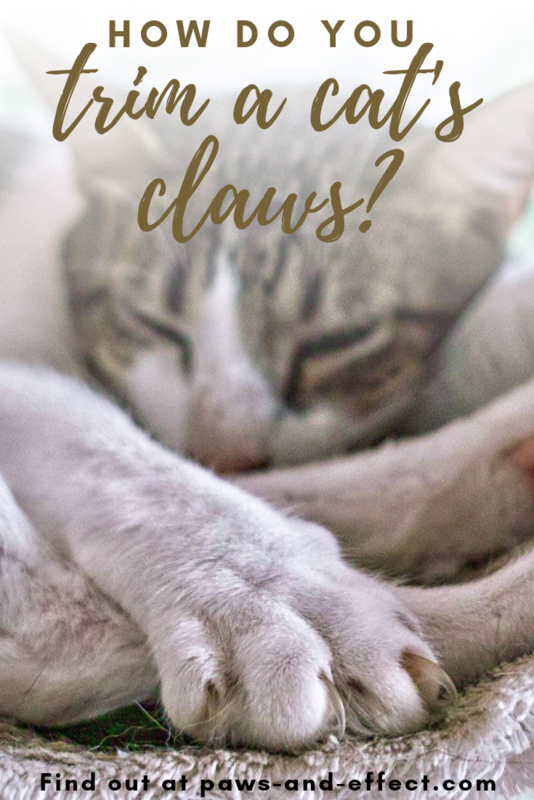 The first part is about whether or not there’s a cat tree that can help your cat shed her claws naturally, and the other part is about how to trim your cat’s claws. So let’s start at the beginning–cat trees and scratching surfaces! Bella: Scratching is a crucial part of cats’ behavior. Not only does it leave a scent mark identifying the “owner” of the scratched object, but scratching also helps your cat to stretch. Tara: You know how you like to stretch when you get out of bed? Well, we cats like to do the same thing when we wake up for a nap. Thomas: Some cats prefer vertical scratching surfaces like scratching posts and trees, while others prefer horizontal scratching surfaces like corrugated cardboard pads. Some cats like both and will scratch vertically sometimes and horizontally other times. Bella: The best material for a vertical scratching surface is sisal rope. It’s natural, and it gives us a good thing to dig into and stretch. Sisal also helps us shed dull claw sheaths to leave the shiny, sharp surfaces of the next layer. Tara: Next layer, you say? Yes, cats’ claws grow in layers. That’s why you’ll sometimes see claw sheaths by scratching posts or even embedded in corrugated scratchers. The trouble is that this kind of scratching actually does not dull the claws; it actually leaves them sharper because the new layer of claw is nice and sharp. Thomas: We hate to say it, but there’s really no such thing as an emery-board type scratcher that can help dull the nails. If there were, we imagine cats would find the texture of the emery board so uncomfortable that they wouldn’t use it. Bella: Are there cat trees actually made of tree branches? Yes, there are. They tend to be expensive because they’re handmade. But there are plenty of do-it-yourself instructions on how to make a cat scratcher from a tree branch. Tara: Ultimately, though, you are going to have to trim your cat’s claws. And we understand that this can be a nerve-wracking experience, so we’ve got some helpful tips. Thomas: To trim cat claws, you’re going to need to get the right kind of tool. Some people use human fingernail clippers because they’re easy and convenient. The trouble is that when you use them, you’re going to tend to crush the nail. We recommend the type of nail trimmer that looks like a tiny pair of scissors. Bella: Mama’s good blogging friend, Catherine Holm, wrote a great article for Catster on how to trim cat claws, and she gives some really good tips like waiting until your cat is very relaxed or sleepy before trimming the nails. Tara: Also, it’s totally okay to only trim one or two claws at a time. The important thing is to leave kitty feeling okay about having her paws handled and her nails trimmed. 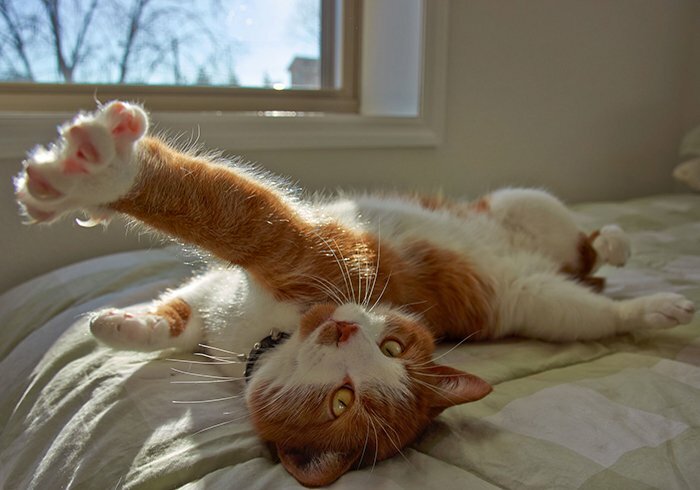 Thomas: To trim cat claws, you only need to snip off the tiniest bit at the end of the claw in order to keep your cat from scratching you, or getting stuck in the carpet, or leaving puncture wounds when she kneads you. Tara: You’ll be able to see how she holds the clippers, and what she does to make the claws show. She also shows you how to avoid trimming the quick–the part of the claw where blood vessels and nerves live. You don’t want to clip that because it’ll hurt your cat and you’ll get blood all over the place. Thomas: Mama used to be really intimidated by trimming our claws, but as she practiced, it got easier for her–and for us! She usually trims just our front claws, but you can trim the back claws as well. Cats tend to be less excited about having their back ones trimmed, though, so we recommend that you just start with the front ones. Bella: It’s really not that hard to trim cat claws as long as you have the right tools and you set yourself and your cat up for success. Tara: So, between making or buying tree-like scratch posts and cat trees, and trimming your feline friend’s claws, you should be able to avoid getting tattooed by your cat’s nails! Thomas: What about you other readers? Do you have any tips for Kris on how to trim cat claws? Please share them in the comments. Bella: Meanwhile, we’ve got to go and hide because Mama’s now gotten it into her head that it’s time to trim our claws! My Cat Won't Let Me Trim Her Claws. Help! Should I Trim My Cat's Burned Whiskers?